Cumulus Media today flipped Sports “95.9 The Fan” WSJZ Sebastian/Melbourne, FL to Active Rock “95 Rock“. BUBBA THE LOVE SPONGE® OFFERS $500 REWARD FOR INFORMATION LEADING TO THE ARREST OF MEN WANTED IN CONNECTION WITH BEATING OF 17 YEAR OLD BOY. On the evening of Monday July 2nd 2012, at approximately 8:40 PM, four men in a 2003-2006 graphite colored Chevrolet truck attacked and beat a 17 year old boy with a baseball bat on west bound State Road 54 in Land O’ Lakes, west of Florida State Highway 41. 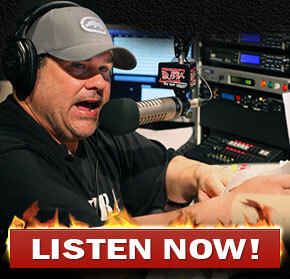 Bubba The Love Sponge® adds “Spice” to the new 102.5 The Bone!!! Tampa, Florida – The Bubba Radio Network® is pleased to announce that long time member of the Bubba The Love Sponge® Show, Matt “Spice” Loyd will join the airstaff at the New 102.5 The Bone to host a talk show weekdays from 7 PM to 10 PM, effective Monday April 23rd 2012. Check out Miss DNA! She won the cover of Maxim! A flurry of last-minute filings Monday guaranteed that each of the three City Council members seeking re-election this year will face opposition, including one match-up that pits teacher against pupil. Bubba the Love Sponge® Clem is founder of The Bubba the Love Sponge® Foundation, a 501 ©3 charitable organization that has raised over $240,000 to date for fallen police officers. Brad Keselowski showed off the new racing surface of Daytona International Speedway to members of the media on Wednesday afternoon and assisted renowned nationally syndicated radio personality Bubba The Love Sponge® in Honorary Pace Car driver practice for the upcoming 53rd annual Coke Zero 400 Powered By Coca-Cola NASCAR Sprint Cup Series race on Saturday, July 2.